Of course, there exist child topics. 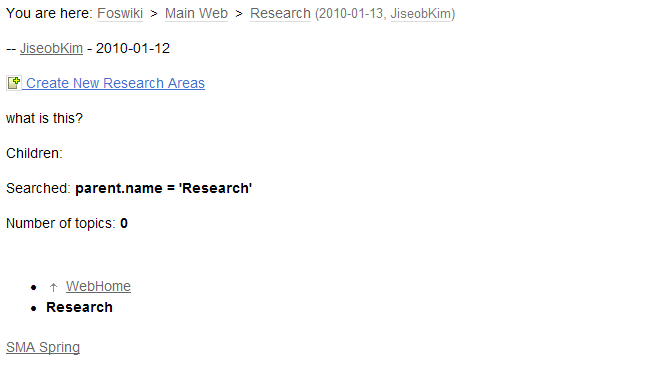 I can see "You are here: Foswiki>Main Web>Research>Misc (2010-01-13, JiseobKim)"
I also checked out 'More Topic actions' tab. But.. I'm not sure what is going on. I've pasted your two examples into some test topics on 3 different Foswiki releases, and it worked in all cases. 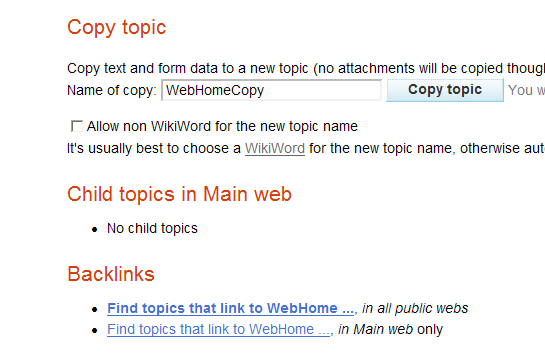 I tried it with both hard coded topic names and also using %TOPIC% in the parent name. Are the children all in the same web, or are they in a different web. What server platform are you running on? Linux, Windows? And what search are you using? Forking, PurePerl, or some other search implementation like NativeSearchContrib. (SearchAlgorithm) is an expert setting in the Foswiki configuration. I'm not sure what else might be causing issues here, just fishing a bit. Topic revision: r5 - 28 Jun 2010, CrawfordCurrie - This page was cached on 24 Apr 2019 - 01:55.